On New Year’s Eve Monday morning, twelve DNCBer’s (Donna, Lorna, Jane, Ken & Anne, Roger, Paul & newbie Sue with Quinn, Bryan without Janet, Kay and me) enjoyed an initially foggy and occasionally snowy morning, that cleared up nicely as we wound our way through the Ladner farm fields to Reifel Bird Sanctuary. 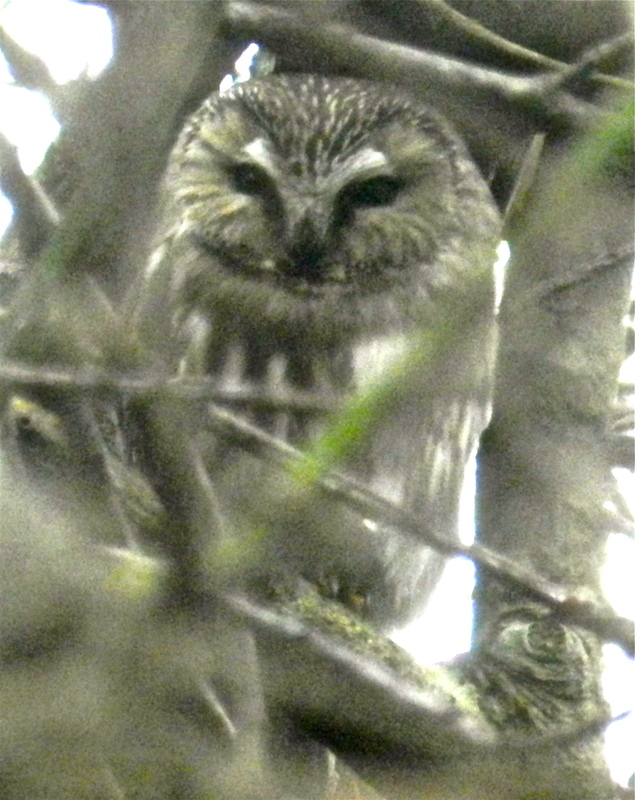 Lots of hi-lites including four Saw-whet Owls, Barn Owl, Evening Grosbeaks, Ruddy Ducks and lots more. 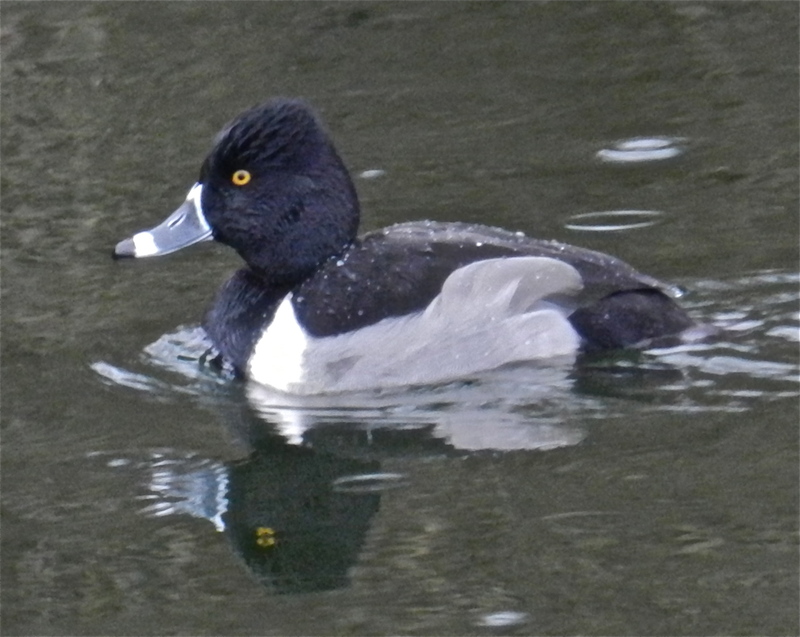 Check out Ken’s photos on our Picasa site at https://picasaweb.google.com/DNCBirding. Four cars left Petra’s shortly after 8:00 a.m., and our first stop was the Kingfisher Bridge at the entrance to the Tsawwassen First Nations lands. 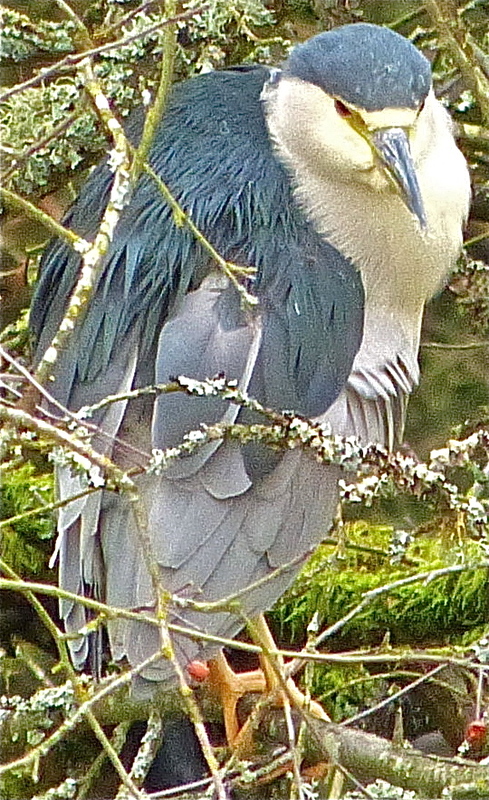 Tide was high, and, as usual, no Kingfisher was around, but lots of Great Blue Herons and Bald Eagles. We continued on and saw that the high tide had pushed mixed flocks of Black-bellied Plovers and Dunlin onto the farmer’s fields. Some of us got good looks through the scope, while others dilly-dallied behind over the continuous Purple/House Finch debate (Purple have forked tails). Trumpeter Swans were in their regular fields, along with Mallards, American Wigeon, Northern Shovelers and Northern Pintail. Northern Harriers and Red-tailed Hawks around too, and Roger spotted a neat Peregrine Falcon perched for good viewing. While examining the Peregrine, Kay found some owl pellets under some conifers along the road. Our search eventually rousted a Barn Owl. At the river lookout at Canoe Pass, there were Common Mergansers, Common Goldeneye and Double-crested Cormorants in the Fraser. I forget whether we saw the Western and Horned Grebes that we often see there, and of course, the resident Mute Swans. We crossed the bridge onto Westham Island and saw more mixed Shorebird flocks. Ken & Anne stopped to photograph a Cooper’s Hawk feeding on a Robin in the middle of the road. It flew into a nearby tree where Jane found it and scared it away before anyone else could see it. She was forgiven because she brought some tasty cookies. We continued on to our “mecca” Reifel and chatted with Laura, and later on Shanna. 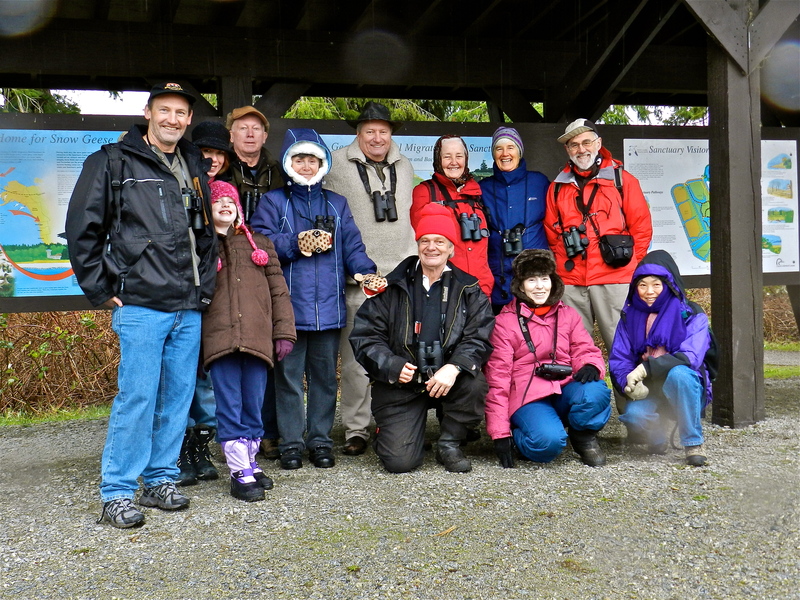 The resident Black-crowned Night Herons were there, and Ken took the obligatory Group Photo by the Snow Goose display. We followed the east dike trail and saw lots of Sparrows (Song, Fox, both Golden- and White-crowned), Red-breasted Nuthatches, Golden-crowned Kinglets, Brown Creepers, Spotted Towhees and of course enjoyed hand-feeding the Black-capped Chickadees. 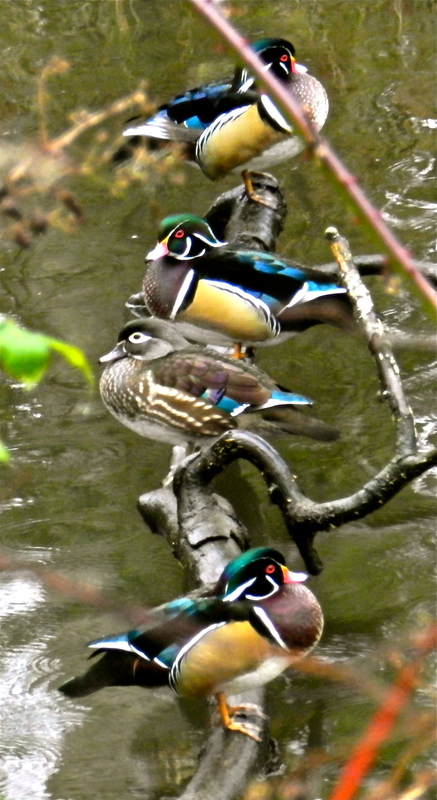 Quinn and I especially enjoyed the up-close-and-personal views of the gorgeous Wood Ducks and Hooded Mergansers in breeding plumage. 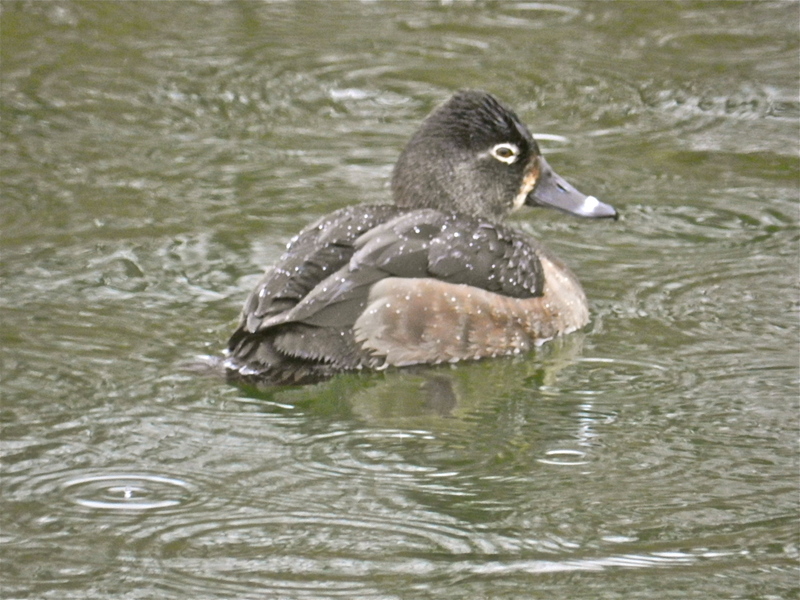 along with some Bufflehead, Lesser Scaup, American Coots and Green-winged Teal. 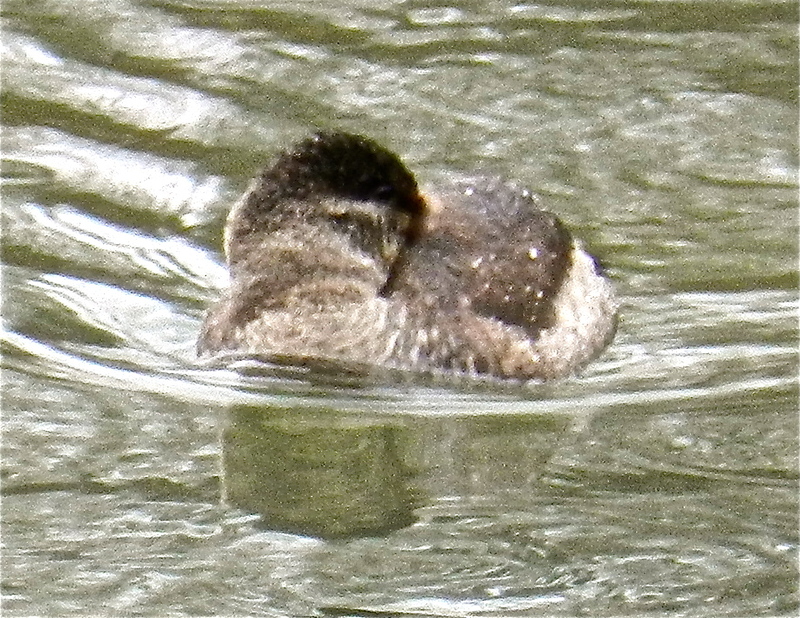 At the lookout were the two Ruddy Ducks. 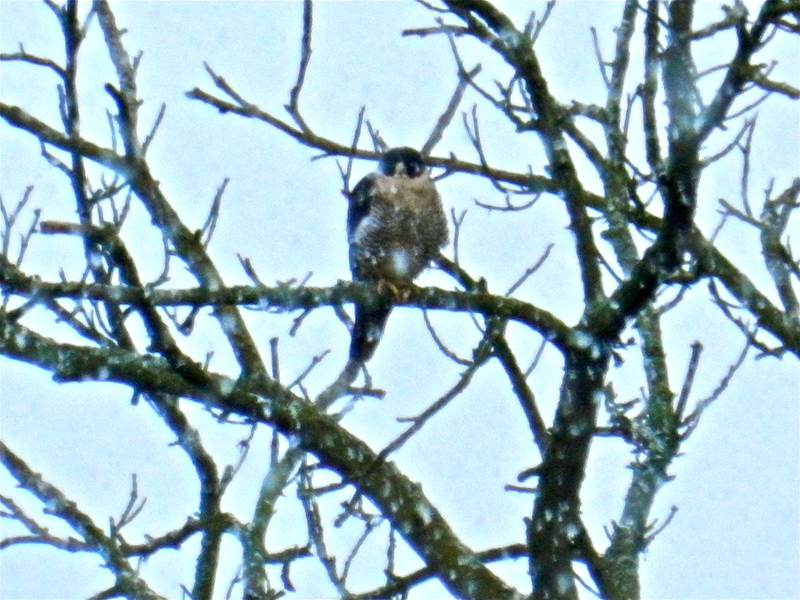 Roger spotted another perched Peregrine Falcon, quite different looking from the earlier falcon; probably a juvenile. We may have seen more species on Monday, but I am a bit mixed up on sightings since I saw so many species on the Ladner and White Rock Surrey Christmas Bird Counts on the two preceding Sundays. 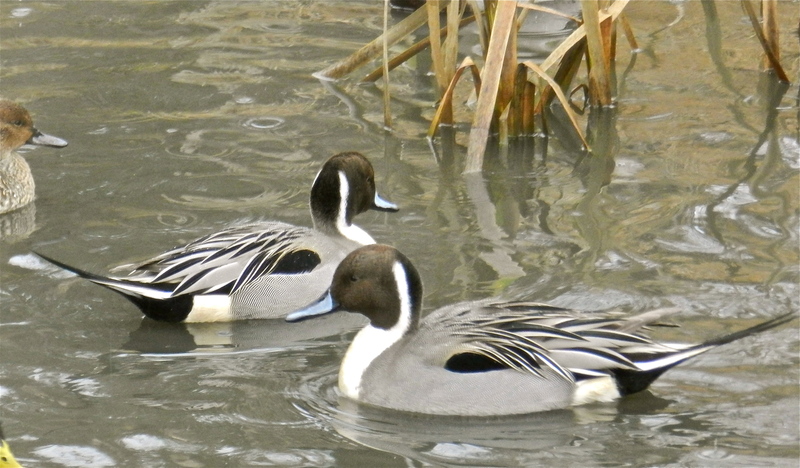 Indeed, the Ladner count of 144 species will probably again be Number One CBC in Canada. On the pleasant drive back to Tsawwassen with the three chicks (Jane, Donna and Lorna), while munching Lorna’s peanut butter and banana sandwich and Donna’s home-made bickies, we saw a nice Rough-legged Hawk. Sandra and I spent a quiet New Year’s Eve at home, with my rum-drinking, cigar-smoking neighbour who also liked Sandra’s chili and specialty salad. Hope you all have a Happy and Healthy 2013, full of love, luck and good birding. This entry was posted in *DNCB, Bald Eagle, Barn Owl, Northern Harrier, Northern Saw-whet Owl, Peregrine Falcon, Red-tailed Hawk, Reifel, Rough-legged Hawk, TFN. Bookmark the permalink. Hi Tom- Anne Murray gave me your birding site. I am one of 3 Colorado Photographers that will be in the Boundary Bay area for about 1 week starting on Sat. Jan 5th. Anne mentioned your birding tour on jan. 7th and said we were welcome to join the group for the day. we would like to join you if that works for you.